Mayor Noam Bramson, following a ride from City Hall to Anderson Plaza. New Rochelle’s Bike Share, the first in Westchester County, officially launched today. 100 bikes, 11 stations throughout the city. Learn more in this press release or join our bike share program at www.bikenewrochelle.com. We actually had a soft launch back in March, just to test everything out, and already more than 400 people have signed up, taking thousands of trips! That’s way above expectations, especially in light of the iffy spring weather, and a positive sign of public enthusiasm. This morning, I joined about twenty other cyclists for a maiden ride from City Hall to Anderson Plaza, and (following a three decade break from bicycles — shhh, don’t tell anyone) aim now to be a regular user. 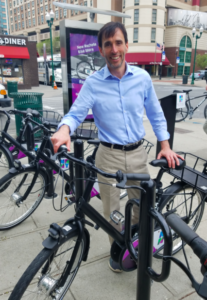 By offering a fun and sustainable way to get around, we help make New Rochelle a healthier, stronger, greener community. It’s also part of our larger effort to compete for the next generation of residents and businesses. Try it out, and have fun.